The use of infrared windows has grown exponentially in industrial applications in the past number of years. Our customers for thermal imaging regularly pose questions relating to IR windows, their use and also their limitations. I have put together the following information that I hope will help in providing a better understanding of what you need to know about IR Windows. Ensuring electrical safety at the workplace has become a matter of prime concern for employers across the world. Infrared Windows help ensure safe inspection and maintenance of electrical equipment and installations, minimise exposure to electric hazards, as well as detect and remedy any faults in power circuits in a timely and effective manner. An IR window is nothing but a separator or viewing port that allows infrared rays to pass through from the source (or target) inspection point to the external environment, where the pattern and temperature of heat generated at the specific site are recorded using a thermal camera. The data, thus, collected is then analysed to determine the health of the equipment or electrical unit under inspection. IR windows find use across different industries and applications and it is important to opt for a suitable one that best matches environment-specific requirements and thermal imaging equipment used for inspection. It is important to note that the solid lenses in viewing panes create a sealed or enclosed environment, where exposure to electrical hazard is minimised to a great extent. Inspection grills, however, require workers and technicians to don suitable PPEs as they do not offer any protection against electrical/thermal hazards. In addition to the above types of IR windows, open or sealed 15-mm IR inspection ports also find use in specific environments. Custom IR window designs help address environment/equipment-specific requirements that cannot be addressed using off-the-shelf standard IR windows, but need expert advice and clearance from safety officials. The choice of IR window lenses depends on the specific application, wavelength range, and environment. Cost considerations will need to be factored in as well. The lens material basically varies based on its use. Both crystal and synthetic polymer lenses are widely used in IR windows. Each type of lens, however, has its own limitations or pain-points that need attention. Properties of the chosen material determine the diameter and thickness of the lens, its mechanical strength, durability, transmission rates and several other factors. Variations in each of these factors eventually tend to affect transmission, compromising the effectiveness of thermal imaging and inspection. Crystal lenses tend to deteriorate when exposed to humidity, mechanical stress, moisture, select chemicals, and high levels of noise or vibrations in the operating environment. Synthetic polymer lenses ideally are suited for industrial settings as they are sturdy and durable, non-reactive to moisture and a wide range of chemicals, and resistant to mechanical stress as they can absorb impact and stay in shape to deliver consistent transmission rates. IR windows, when installed right, to a great extent minimise exposure to electrical hazards, apart from a few exceptional cases involving very high ambient temperatures. Here are a few points to consider when installing IR windows. The type of IR window and lens material needed to match the working conditions, equipment, wavelength of rays being studied and the device used for thermal imaging. Use of custom IR windows need approvals and clearance from concerned authorities to vet their aptness and safety. Environmental safety or suitability of an IR window for a specific operating condition is based on Ingress Protection (IP), National Electrical Manufacturers Association (NEMA) standards. The NEMA/IP rating of the IR window must not be less than that of the structure housing the window. The diameter of the view pane is determined by field of view (FOV) of the IR window, the thermal camera and lens attachment (if any used). FOV of an IR window is the maximum area that can be observed using the unit. Typical FOV spans the distance from the panel cover to the observed targets, starting at the vertex of the viewing angle. FOV is bound to vary based on the lens type and material. Diameter calculations are usually based on standard lens settings. Radiation from a specific target is either reflected, transmitted or emitted by the object being observed. Standardising emissivity in a de-energised setting is a must before installing IR windows to ensure accurate readings. 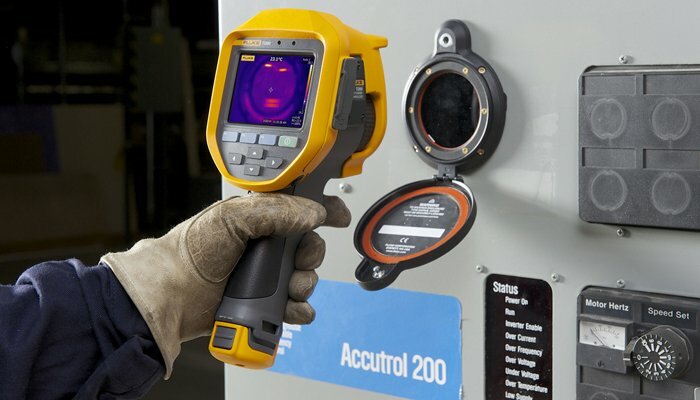 Setting benchmarks, including IR window maintenance as a part of scheduled equipment maintenance and periodic re-calibration of transmittance to offset degradation in select types of IR window lenses, is recommended for accurate and reliable thermographic inspections. While the UL50V standard aims to define an IR viewport and window, others such as UL508 and UL 508A outline the requirements of control panels and equipment in specific industrial settings. The UL 746C standard requires polymer components used in IR windows to be flame-resistant at room temperatures and impact resistant at 0°C. Ingress protection standard IP65 and NEMA 4 are indicative of resistance against water ingression and dust. IR windows by themselves are not electric arc-resistant; however, they are arc-rated along with the electrical unit in which they are housed. Accidental exposure to energised or faulty equipment, and deadly electric arcs take a severe toll on the health and lives of workers, especially those employed in industrial or power sectors. Installing IR windows can enhance safety levels for routine inspections and maintenance jobs involving electrical installations and equipment at industrial facilities, improving the electrical safety of the entire workplace in the process. For further information, email us or call us on 057 866 2162.